By Thomas Weinzierl, Weinzierl Engineering GmbH. The IoT (Internet of Things) is currently on everyone’s lips. 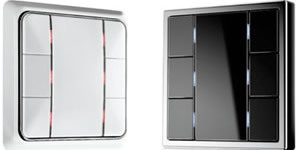 The fact that many systems can be connected via the Internet has been a reality for some time, but for the consumer, access is typically via a PC or smartphone, and they are faced with a choice of questionable applications and gimmicks, such as refrigerators that order milk and butter, switchable sockets or Internet-enabled lights. 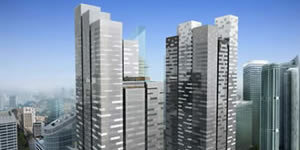 And in the professional field especially, there is a lack of concrete solutions and products. A major issue that is holding the IoT back is the use of different protocols, that is, the languages with which connected devices communicate. In the IoT, there is something akin to the Tower of Babel’s confusion of languages. The fact that devices use TCP/IP or UDP is not enough to exchange information. It is like human languages – many may use the same letters, but they are all different and communication between them requires interpretation. 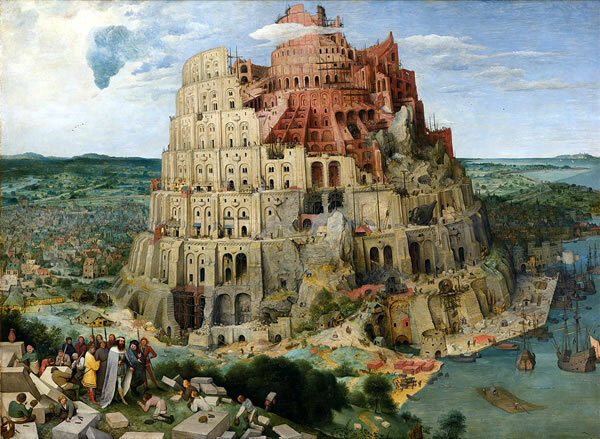 The Tower of Babel is an origin myth that is meant to explain why the world’s peoples speak different languages. Even though there are currently numerous – even proprietary – approaches to solutions, experts are certain that only open standards will prevail in the long term. 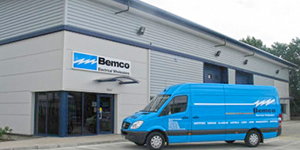 Apart from the obvious basic suitability for building control, additional aspects, such as how secure communications are, are bound to influence choices. 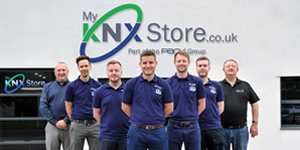 One language that has long prevailed in professional building technology is KNX. The KNX protocol is mainly used with the two-wire KNX TP (Twisted Pair) bus, but is also specified for radio (KNX RF) and for the Internet Protocol (IP). Here, IP is not limited for use in interfaces and routers. 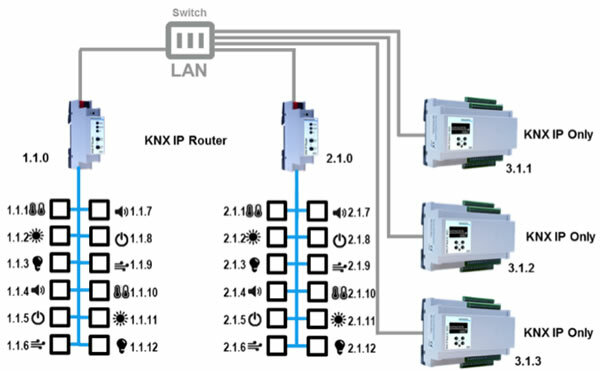 KNX IP is a complete medium, just as KNX TP or KNX RF are. This means that devices can be connected directly to the KNX installation via a LAN interface. As in the case of all KNX System Mode (see the article Programming KNX Installations using ETS, Now and in the Future) devices, commissioning is done using ETS software. This means that devices using KNX IP also have a physical address and use group telegrams for data and commands. The group telegrams are transmitted via IP as UDP multicast telegrams, so that they can reach several devices simultaneously via IP. The download by ETS can be made point-to-point via the IP address of the device. Thus even complex devices can be changed via IP in a few seconds. In the future, KNX installations are almost certainly going to involve a combination of several media. Whilst the majority of distributed sensors, such as pushbuttons, will continue to be connected via the green KNX TP cable, IP-capable devices can be connected via a KNX IP router. For places where no cable can be laid, KNX RF offers a wireless alternative. The connection to KNX RF is possible via a media coupler. For the installer, it is crucial that all devices are planned and programmed with just one ETS project. The group addresses are valid across all media. Although the specification for KNX IP and the corresponding integration into ETS have been available for some time, there are only a few devices currently on the market that support IP as a KNX medium. 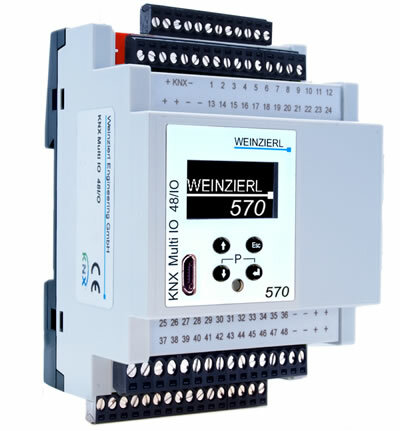 The Weinzierl KNX IP Multi IO 580 is a universal input and output module for building control. It offers 48 digital channels and allows outputs to be controlled directly via Ethernet/IP or inputs to be queried and evaluated. Each channel can be used as a binary input or output or for controlling a blind. Peripherals can be powered by an external power supply (24V DC). 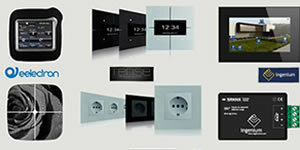 Input channels may be used to control, for example, lights or blinds via KNX. However, they can also be configured as pulse counters, for example for energy meters with S0 output. Output channels can directly control signal LEDs or external relays. An easy-to-read OLED display on the front panel enables manual operation to test the installation. 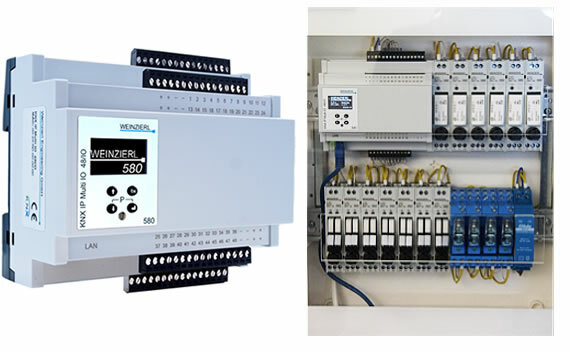 (Right) Weinzierl KNX IP Multi IO 580, (left) integrated into an installation. For installations where IP is not an option, the Weinzierl KNX Multi IO 570 is available as a variant for KNX TP (Twisted Pair). It shares the same functionality as the IP version but connects to the KNX network via the classic KNX bus. It provides an integrated KNX USB interface which can be used for commissioning the device, as well as for accessing the complete KNX system. The Weinzierl KNX Multi IO 570 is available for KNX TP and shares the same functionality as the IP version. 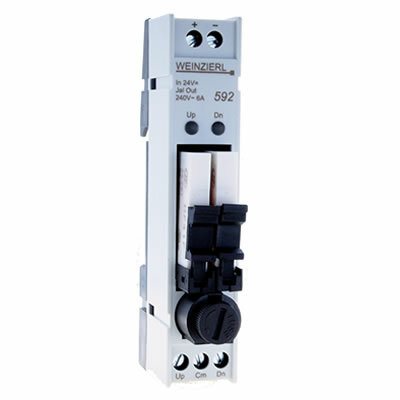 The Weinzierl Multi IO Extension 590 serves as a power-saving alternative to commercially-available coupling relays. The coupling relay is controlled as a mono-stable relay, but uses a bi-stable relay internally, thus reducing the holding current by up to 95%. The Weinzierl Multi IO Extension 590. The Weinzierl Multi IO Extension 592 has been specially developed for the control of blinds and roller blinds. The double relay is connected to only one output of a KNX Multi IO and integrates the relay outputs for both directions. The outputs are electro-mechanically locked against each other. The Weinzierl Multi IO Extension 592. Thanks to products such as the KNX IP Multi IO 580, Weinzierl is helping to bring the Internet to Things. Weinzierl’s devices have been designed to be suitable for installation in commercial and domestic environments, and they open up a new world of system architecture for existing and future KNX installers. Dr.-Ing. Thomas Weinzierl is the CEO of Weinzierl Engineering GmbH, manufacturer of KNX products and provider of a full range of hardware and software development and testing services.